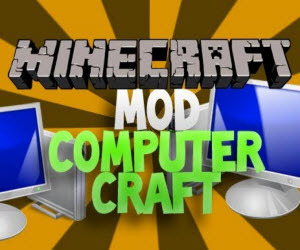 The ComputerCraft mod brings your Minecraft world into the Information Age by adding over ten new technology related items to the game. You’ll find working computers, modems and even a robot that will farm your fields and mine your caves automatically. Let’s take a look at some of the more awesome items, features and possibilities you’ll get by installing this mod. It would be quite tedious if you had to rewrite a program every time you needed to accomplish a certain task. That’s why the ComputerCraft mod for Minecraft offers the ability to store your programs and data on a virtual Floppy Disk. Once it is crafted, you can then access the information using the Disk Drive block. If you dislike the Minecraft jukebox, the Disk Drive is also capable of playing the music disks you get from killing Creepers. If you want to transfer a program or game without traveling long distances by pig, you can use Wireless Modem blocks to transfer data up to 64 blocks away, granted that the skies are clear. If you play on a server with a lot of people, it makes it easier to share your programs without having to personally deliver a floppy disk. One of the coolest new features that the mod adds to the game is the robot-like device called a Turtle. It is armed with both its own computer and special operating system. TurtleOS has all of the features of CraftOS, plus a whole set of special abilities courtesy of the included Turtle API. They can fight enemies, collect their loot and store it in a chest for you to collect later. Since they are fireproof, the robots can collect valuable ores in dangerous cave systems for you without having to risk your virtual life near lava pits. In addition to mining tunnels, the Turtle can take the resulting dirt and cobblestone and build you a brand new house or castle, all to your specifications. This mod is great for large servers with a technology theme, and the ability to share programs makes it accessible to players who don’t necessarily have a background in computer programming. There are other great minor features too like printers and upgraded computers that allow for color programs. The robot mining Turtle is something that any player can appreciate, and the whole package combined makes this mod a must-have.